Outer trench swells are geoscientific frontiers and much remains to be learned about them. Recent volcanoes have been discovered on ~135-million-year-old Pacific Plate east of Japan (Hirano et al., 2006). These small alkalic volcanoes are small percent melts of asthenosphere that exploit bending-related lithospheric faults to reach the seafloor. Hirano et al., (2006) proposed that these small volcanoes erupted along lithospheric fractures in response to plate flexure during subduction. 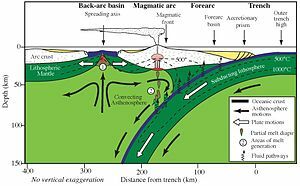 If bending-related faulting and serpentinization is an important process beneath outer trench swells, there are probably also abundant low-temperature hydrothermal vents on the swells, similar to those of the Lost City (hydrothermal field). This page was last edited on 24 August 2018, at 06:27 (UTC).